Colin Goldie Whistles > Players - Music - Videos > Tomoaki Hatakayema "Hatao"
Players - Tomoaki Hatakayema "Hatao"
Hatao is well-known as one of the finest players and teachers of the Irish flute and Tin Whistle in Japan. He has been playing traditional Irish music for over 10 years and performed professionally throughout Japan. He has produced more than 5 CDs and also joined recordings of the major artists as a guest player. 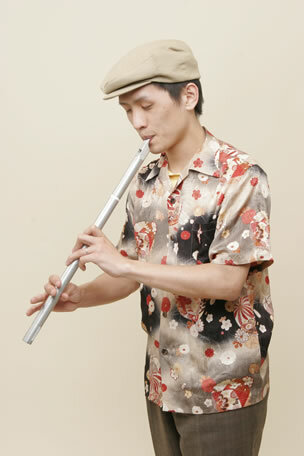 He is an authur of the turorial book of Tin Whistle which became the first turorial book published in Japan. I have been a great fan of Goldie Whistles since the first time I played the Tenor D whistle. Goldie Whistles have high quality tone and accurate tuning in full range. I especially like the F and Bass G whistles. I also import Goldie Whistles and encourage Japanese whistlers to play them. Alto F whistle: "Circluar Breathing"